Explosions and mayhem make up the introduction to Lucas Sterling’s debut novel, Srepska, immediately throwing the reader into the after effects of a massive cyber attack in Kenya. Personal, business, and federal accounts have been digitally looted leading to a state of emergency. Fearing repeat on a larger scale, Agent Frederic Ulrich is tasked with seeking out those responsible, though the feared group ‘Srepska’ is immediately suspect. The scant bread crumb trail points to the U.S. as the next target, but a possible mole leaves Agent Ulrich unsure of friend or foe. With the aid of Lars Christopherson, he must find a way to inform and prevent the next attack. Srepska is definitely deserving of it’s place in the action genre. Lucas Sterling brings to the table an adrenaline packed story that is made all the more intense by it’s relatability. Set in modern day, the Information Age as we like to call it, Srepska is a story you could very well see taking place in our own reality, the focus being a cyber attack. The suspense is therefore intensified given the fact that such attacks in the long scheme of things are still fairly new, meaning effective defenses are still being regularly updated and changed. This is felt throughout the book by many of the characters, with concern on how to combat such a threat that initially seems faceless. We follow Frederic Ulrich and Lars Christopherson through the story as they team up to put a stop to things. Sterling presents us with two characters very strong in their trade. We are treated to an inside look to their jobs, but the characters themselves lack some dimension. This could be due to how fast paced the story is, moving from action to suspense and back again in quick succession, leaving little room for character development. Following the bread crumb trail of clues is exciting given how so many countries have been after this group for so long. Things just seemed to fall in to place too easily in some respects. And I felt that there were some sections where settings were over explained, when all I wanted to do was to get back to what this novel does best, the action! 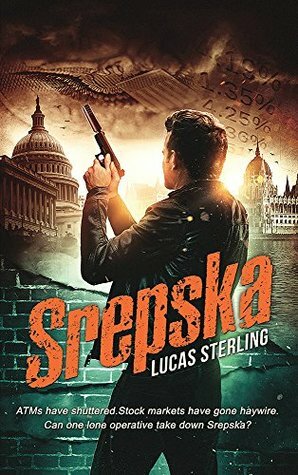 All in all, Lucas Sterling’s Srepska is quite the page turner. The fast pacing keeps the reader engaged and the highly relatable and believable content adds to the feeling of suspense, leaving the reader all the more eager to see the success of the main characters in their goals. A very exciting read!